The Meteor F Mk 8 G.41K is a Rank V British jet fighter with a battle rating of 8.0 (AB/RB/SB). 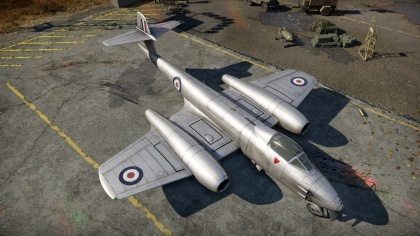 This aircraft was introduced in Update 1.29.
? ? 12 500 ??.? ??.? ??.? ??.? ??? 12.7 mm Steel plate in the nose. Engines are a massive improvement over previous models, with high speed and acceleration rates compared. Good at turning below 650 kph. Guns have good ammo capacity (190 RPG). Wing controls tend to lose control ability at higher speeds. Limited visibility out of rear of cockpit. 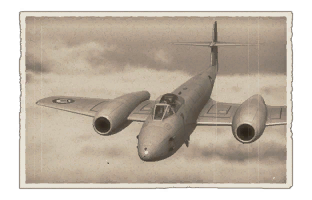 Faced with an increasing quality in the standard of potential adversaries by the late 1940s, Gloster designers embarked on developing a new version of their Meteor fighter, designated the Gloster Meteor F.Mk.8 (Type G.41K). The first prototype F.Mk.8 was converted from a production F.Mk.4, before a full prototype flew on October 12th 1948. Production began in 1949 and, after the RAF stood up its first operational squadrons in 1950, export versions were then produced. The F.Mk.8 differed in a number of key areas from the F.Mk.4 on which it was based; the F.Mk.8 had an elongated fuselage and the tail assembly was changed, both features incorporated to increase stability. An extra 432-litre fuel tank was also added and a blown cockpit canopy was mounted to increase visibility. The F.Mk.8 was powered by Rolls-Royce Derwent Mk.8 turbojet engines producing 1,630 kg of thrust. The diameter of the engine's air intakes was increased, adding approximately 100 kg of thrust to each engine, bringing the aircraft's maximum speed to 950 km/h. The wing structure was significantly reinforced, with additional alloy steels being used in the framework. The nacelle structure was changed yet again to improve access. The F.Mk.8 had the F.Mk.4's 20mm British Hispano Mk.II cannons replaced by Hispano Mk.V cannons of the same calibre but with a higher rate of fire, reliability and ballistic characteristics. A standard mount to suspend HVAR missiles was provided under the wing panels. The F.Mk.8 was the first Meteor to be fitted with a Martin Baker ejection seat; the pilot's chances of survival in an emergency were significantly increased, but the large headrest impaired his rear view. 747 Gloster Meteor F.Mk.8 fighters were produced by April 1954 and were (at various times) in service with over 40 RAF squadrons. From 1950 to 1955, the Meteor F.Mk.8 was the mainstay of RAF Fighter Command. The F.Mk.8 aircraft were also accepted for service with the Air Forces of Australia, Belgium, Brazil, Denmark, Israel, the Netherlands and Syria. Meteors of the RAAF (Royal Australian Air Force) took part in the Korean War although they were outmatched by the more modern MiG 15; although several MiG 15s were destroyed by pilots of 77 Squadron RAAF, losses were heavier and the Meteor was re-roled to ground attack. Experience in the Korean War highlighted the fact that, even with significant upgrades to its original design, the Meteor was now outclassed by more modern fighters. Different Gloster Meteor versions were flown in training and auxiliary units until the last Meteor trainers were phased out of service with the RAF in 1965. This page was last edited on 17 April 2019, at 15:33.